While case studies such as “the painting of the month” highlighting a work in the permanent collection are of real interest (new information, identifications or acquisitions are often presented) those focusing on only one work from another museum are rarely justified from a scholarly point of view . A single object is not enough to develop a pedagogical argument. On a smaller scale, this corresponds in fact to something we have denounced for a long time : overlooking the permanent collection to artificially create an event by presenting a spectacular staging of a masterpiece taken out of context. Unfortunately, these shows continue to proliferate. 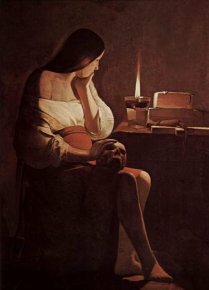 The most recent example is that of the Louvre’s loan of one of its most prestigious canvases, Mary Magdalene in Penance by Georges de La Tour (ill. 1) to the Prado (until 28 June). An event with extensive media coverage as it was inaugurated by Nicolas Sarkozy during his visit to Madrid. Relations between the two museums were at a minimum for a long time , with each preferring contacts with American institutions, and more recently for the Spanish museum, with the National Gallery in London . Today, the Prado and the Louvre are working at establishing closer ties. This should be cause for rejoicing but in the light of the latest developments, we fear the worst . Until now, thanks to a particularly scrupulous and independent supervisory board, the Prado had avoided the commercialization of its works. Things have now changed. The arrival of a new director in 2002, Miguel Zugaga worried those who feared the dangers of cultural globalization although he proceeded carefully and was criticized at times. The introduction of contemporary art there has stirred a debate and exchanges with other museums are even at times cause for ridicule : last summer the Prado moved the Dos and Tres de Mayo by Goya to the Museo de Arte Reina Sofia, located on the same avenue two hundred metres away (to juxtapose them with the Guernica and obtain temporary loans of Picasso works). 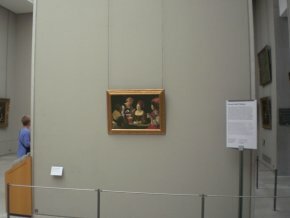 Despite his tendency to see the Louvre as a role model to follow, the Prado director is not the only one responsible for this policy : like in France, the very expensive additions of reception areas and spaces for temporary exhibitions, the government’s demand for rigorous budget management, the transition to a classification as a public establishment and the competition with other establishments force it to increase its spending and increase visitor attendance (and consequently, the soaring price of entrance tickets). The Prado stages remarkable exhibitions of case studies on a regular basis, such as the one recently on The Marriage of the Virgin by Pedro da Campana, normally held at the Toledo Cathedral after its restoration by the museum workshops. And yet it has just gone astray by creating a new cycle of exhibitions entitled “La obra invitada” displaying a single work from another museum, the first one thus being from the Louvre. In passing, let us add that there is no proof that this type of operation draws new visitors or guarantees the attraction of old ones. Tourists passing through will benefit from this stroke of luck and enjoy one more masterpiece amid hundreds of others whereas the few educated art lovers in Madrid who make a special effort to go see it are already familiar with the work having discovered it on previous travels. Those who don’t usually go to museums will not bother going to the Prado to view a painting which is not part of the collection. 5. Musée du Louvre, Sully, room 28, central wall. The press release boasts of Georges de La Tour as “the most Spanish of the 17th century French painters” (Andrés Ubeda, curator at the Prado), due to his tenebrism which is however common to most of the painters of the first half of the century. One might argue that at that time king Philip IV, in fact, was only interested in French painters active in Rome. We are also told that this painting rounds out temporarily the gaps in the Prado collection, which is partly false as the museum already owns a La Tour and that another one, recently discovered (see news item, in French, of 3/6/05) in a government building is on deposit there today. The paradox of “invited works” seems obvious : they deprive one museum to benefit another since the lender then finds itself in most cases with an incomplete representation of the artist. A better choice would certainly have been the Infanta Maria-Margarita to compare it to the authentic Velázquez works (see editorial, in French, of 25/12/06 and the news item of 3/2/09) or the child’s portrait by Goya promised on loan to the Prado but delayed at the last minute by Yves Saint Laurent (see news item of 1/10/08). Some of the more impertinent Spanish media have even poked fun of the situation, recalling the bicentennial of Joseph Bonaparte’s installation on the throne. At the time, they say, the Louvre received masterpieces looted from all over Europe by Napoleon ; today, it’s just the opposite. This way of proceeding is not characteristic of the Prado. 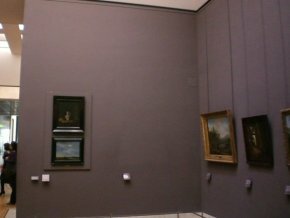 Some museums request the loan of major paintings in exchange for their own contribution to a major exhibition (the National Gallery in London often practices such a policy). We will give two examples : the transfer by the Louvre of the Pilgrims from Emmaus by Titian to the Ambrosiana in Milan to obtain Paradise by Palma il Giovane and that of Liberty Guiding the People by Delacroix to Japan in exchange for Kudara Kannon. For the past few years, the Frick Collection in New York welcomes hangs of a single painting and exports some of its rarely available works (as most of them have been banned for loan by the donor). It has signed an exchange agreement with the Norton Simon Museum in Los Angeles who will exhibit the Countess of Haussonville by Ingres, after welcoming this winter the Woman Writing a Letter by Vermeer from Washington (National Gallery), before traveling now to Dublin and then Amsterdam. The new director of the National Gallery in London, Nicholas Penny, although hostile, and correctly so, to blockbuster exhibitions of little scholarly interest, has stated he is favorable to presentations of a single work, not realizing that this raises the same ethical questions. As its name indicates, “an invited work” often implies that the invitation be returned and other works be sent. The taboos concerning rare artists, with works known to be fragile, are swept away at the price of endangering their conservation for future generations. It is a complex matter to organize an exhibition on Piero della Francesca, Vermeer or Georges de La Tour but moving one work is a whole lot easier to do. 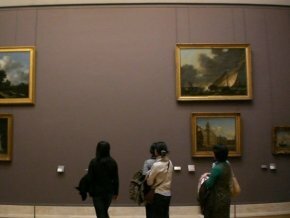 The claim that this is to attract the curiosity of more visitors does not hold ; in fact, the same forty or so paintings are always the ones who fall victim to this practice, from Leonardo to Rembrandt, from Ingres to Van Gogh and Cézanne… Famous works, which are very well known and reproduced everywhere. 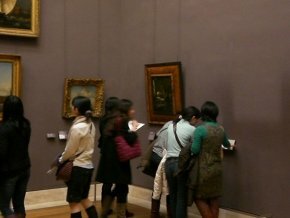 In concluding, we would be remiss in not mentioning the problem raised by the transfer to Shanghai in 2010 of seven masterpieces from the Musée d’Orsay which will be displayed at the French pavilion during the Exposition Universelle. The Angelus by Millet, The Balcony by Manet, The Dance Hall in Arles by Van Gogh, the Woman with a Coffepot by Cézanne, The Theatre Box by Bonnard, The Meal but also The Bananas by Gauguin and The Bronze Age by Rodin, all crucial references at the museum which visitors to Orsay will not enjoy for over six months, for debatable reasons (Universal Expositions no longer hold the importance and interest they once had in the 19th century). One might imagine the comparison of two similar works or a separated pair, but this is never the case. Another illustration of a good choice is the presentation by the Louvre as painting of the month, in March 2009, of the Virgin with Cloak belonging to the Museum du Puy and restored at the Louvre. This was a real discovery, both legitimate and successfully done. Or even bad, as recalled during the last exhibition by Henri Loyrette at the Musée d’Orsay, Manet Vélasquez, in 2003. See the review of the exhibition Renaissance faces and that of the exhibition Velázquez, in French. The site for la force de l’art 2 and for the Louvre tell us that that this puzzle is displayed next to the original, but in fact, it is indeed there in its stead. In the same way, Spring by Arcimboldo replaces the original presented at the Grand Palais in the exhibition Une oeuvre peut en cacher une autre. Of course, this also applies to the Georges de La Tour from Rennes (The Newborn Babe) or Nantes. Missing Arcimboldo works that also “benefit” from a puzzle substitute. See note 5.